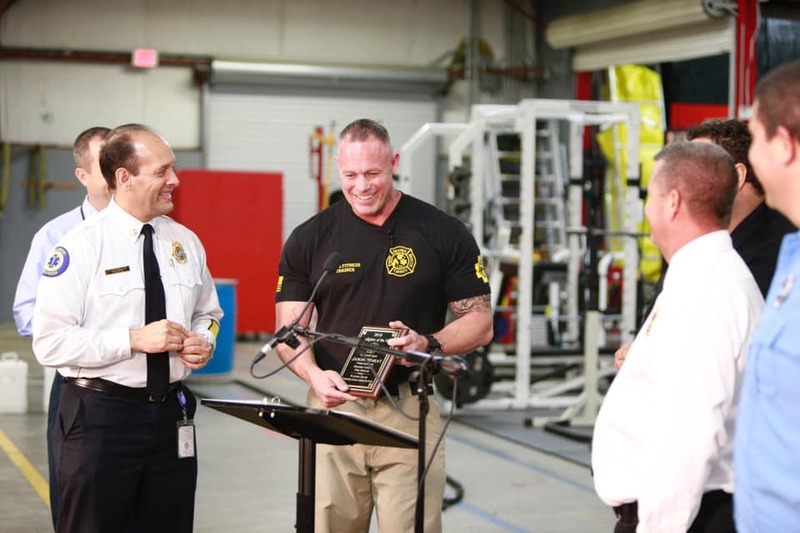 The Florida State Firefighters Association (FSFA) presented Orange County Fire Rescue Department’s (OCFRD) Firefighter Jason Wheat with the annual Firefighter of the Year Award. Wheat was selected to receive the award as a result of numerous peer nominations on behalf of his continued dedication and service. His commitment is credited with positively impacting the health, safety and well-being of firefighters throughout the state, ultimately helping to save their lives. Wheat joined OCFRD’s Safety & Wellness Section as a peer fitness trainer in 2015. Wheat’s primary focus remains on strengthening the personal and professional health and fitness of firefighters, along with their mental resiliency. His role as a peer fitness trainer is a natural fit, given his background as an all-star athlete and military veteran. Orange County was most proud to learn of the announcement, noting that while his contributions locally have not gone unnoticed, this state recognition is well-deserved. “By focusing on the health of our firefighters, they can better serve our community and return to enjoy their families. We congratulate Firefighter Wheat on being recognized by his peers for his commitment to the health and safety of our fighters,” Fire Chief Otto Drozd said. The FSFA award is presented in conjunction with the Chief Financial Officer and State Fire Marshal Jimmy Patronis’ 2019 Fire Service Awards. Wheat will also be presented with this special recognition by CFO Patronis in Tallahassee on April 1, following the Firefighter Memorial Monument Dedication Ceremony at the Capitol.